The dawning of the year 1917 saw Imperial Russia in an unstable position. The people were furious with Czar Nicholas II and his continuous dissolving of the Duma, or the Parliament that was meant to speak for the people. They were enraged at their nation’s continued involvement in the Great War. An involvement that had cost them more men and more supplies than any other nation in any other war previous. By the end of this year, two revolutions will redefine the Russian people, their politics, their social norms and their economy. In February of 1917; starving, furious, overworked Russian citizens took to the streets of Petrograd (modern day St. Petersburg) in protest of the Imperialistic rule of the Tsar Nicholas II. By March 10th, the strike and protest had spread across Petrograd and nearly all of its citizens had taken to the streets. March 11th saw the Petrograd garrison being called up to quell the strikers and protesters. It was not to be, however, by March 12th, so many of the garrison defected to join the strikers the revolutionaries were victorious. The soldiers set up committees and elected officials into a Petrograd Soviet. This forced the imperial government to step down, and the Duma set up a provisional government that worked peacefully with the Petrograd Soviet to see the revolution through. On March 15th, 1917 Czar Nicholas II abdicated the throne and worked to turn it over to his brother Michael. Michael refused the crown which brought an official end to the czarist government. 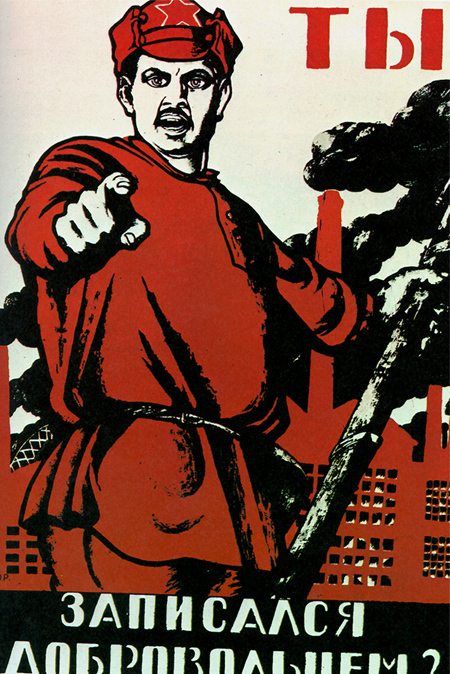 Above is pictured one of the most iconic Propaganda Posters the Red Army produced during the Russian Revolution (1918-1921). The February Revolution ended and the Bolsheviks took control of Petrograd and Moscow in a almost bloodless coup know as the October Revolution that saw their leader, Vladimir Lenin form and take control of the first Marxist State in the world. Peace in Russia would only be temporary, however. Many groups opposed Lenin and his Bolsheviks on the front that they believed his terms with Germany gave Russia a soft face and portrayed them as a weak nation willing to give up what was considered theirs rather than to fight. From 1918 to 1921, the Russian Civil War would rage between the Bolshevik Reds and the Nationalist Whites. This civil war would ultimately tip in the favor of the Reds, leading to the establishment and creation of the Union of Socialist Soviet Republics, or the USSR. The recruiting poster above captures that which the Bolsheviks stood for perfectly. It is overwhelmingly red, the party’s color and symbol of pride. In the background, there stands a large factory with billowing black smoke rising from its many smokestacks. This shows the Bolshevik’s thirst for power, industry and their ability to create jobs and as a result wealth for their people. The soldier stands tall and proud to serve his party. His features are reminiscent of those of the scythians, the group of whom the Russians took pride in calling their ancestors. Much as the Uncle Same recruiting poster does in the United States, this poster portrays the ideal “party man”. Someone willing to sacrifice it all for the red of then Bolshevik Russia. Similarly, the poster asks “Have you volunteered?” putting the metaphorical ball in the court of the observer pressuring them into doing his or her part for the greater good of the socialist regime. For the Reds, the poster served as a physical representation of their battle cry and wish for the triumph of their Marxist government. Much as the song Red and Black goes, the poster gives voice to the cry of, “Red: a world about to dawn! Black: the night that ends at last!” It gave an idealistic view of the Bolshevik Party and served to motivate the people of Russia to join the fight on the side of the Reds. If you want to know more about the Revolutions of 1917, the Russian Civil war, the Bolsheviks, or the song Red and Black check out these links! Yes, “Uncle Sam Wants You!” has nothing on this appeal, right? You offer some compelling insight on how the Bolsheviks’ mobilized support in this critical period. And I love the way you invite your reader to pursue more research. Speaking of which, I hope everyone notices that there’s a course at BU working on a similar kind of web project. (Tweeted about this to #sovietculture in hopes of upping your google juice. Finally, invoking anything Eddy Redmayne is a good idea!